MASSIVE is a sonic monster – the ultimate synth for basses and leads. The virtual-analog concept belies the contemporary, cutting-edge sound it generates. Clearly laid out and easy to use, MASSIVE gives you earth-shuddering sounds from the very first note. 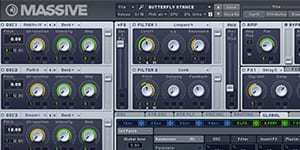 MASSIVE gives your tracks a solid foundation with the creamiest, punchiest basses. Razor-sharp leads cut through the mix even with grit and dirt piled high. And an overwhelming array of wavetable oscillators, modulation options, and filters and effects offer a sonic spectrum as broad as it is inspiring.